The two players have left the club, with Wylde saying he hopes his move will "save other people's jobs". 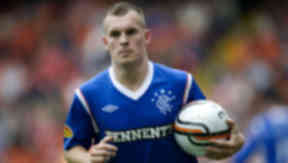 Gregg Wylde and Mervan Celik have left Rangers voluntarily, ahead of possible job cuts at the club. STV understands Wylde has agreed to waive his March salary and will not take any redundancy package. "I wanted to help out the club by keeping people in a job," Wylde told STV. "I was so tired I couldn't really sleep at night. "It was getting to me so I thought I would leave." STV has learned that Southampton have already made enquiries to Wylde's representatives about taking the winger to St Mary's. Celik has joined Wylde in asking to leave Rangers of his own accord, with more players in discussions over ending their contracts. STV has learned that the Sweden Under-21 cap has offers on the table from two clubs in his homeland. Administrators Duff and Phelps rejected an offer from players to defer wages on Tuesday and warned more than 11 playing staff would go if pay cuts could not be agreed immediately. Wylde made his debut for Rangers in a match with Hamilton Academical in August 2009 and went on to make 47 appearances, scoring two goals. Celik only arrived at Rangers in the January transfer window after leaving GAIS at the end of his three-year deal. The signing caused controversy after his former team claimed they were due around £240,000 from the Ibrox club as compensation for their time developing the player. The Swedish Under-21 international has made six appearances for the club, several of those from the substitutes bench. He made his debut in the 4-0 win over Hibernian before making his last appearance in Saturday's 2-1 loss to Hearts.